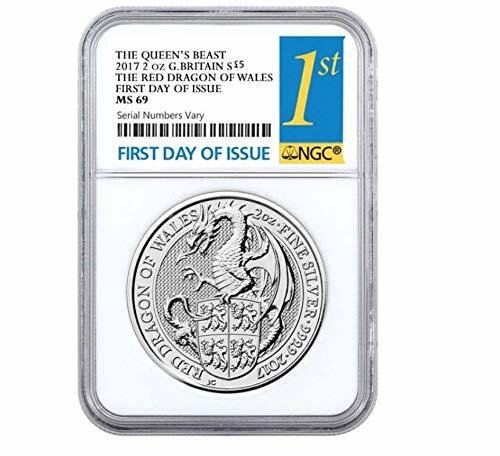 2017 Great Britain Queen's Beast (Red Dragon) 2 oz Silver Coin This astounding 2017 Great Britain 2 oz Silver Queen's Beast (Red Dragon) Coin is the 3rd coin released in the beloved Queen's Beasts series from the Royal Mint. Struck from 99.99% pure silver with a weight of 2 troy ounces, this coin is a treasured addition to your portfolio and a precious gift for any passionate numismatist. The Queen's Beast Red Dragon is the third coin issued in the series, the second being Queen's Beast Griffin. The red dragon has been represented on a badge used by Owen Tudor and was later taken by his grandson, Henry VII. The beast gained popularity due to its association as a battle standard of King Arthur, as well as other ancient Celtic leaders. The Celtic dragon represents power and sovereignty. During Tudor's reigns, the red dragon was depicted on the coat of arms of the English Crown. Today, the Red Dragon of Cadwallader is the emblem on the Wales national flag. The coin showcases the mighty red dragon holding in its claws a shield bearing a lion in each quarter. The coin's exceptional design and high purity make it an excellent addition to any portfolio and a wonderful gift. Coin Highlights: Produced from 2 oz. of .9999 fine silver. Legal tender coin with a 5 GBP face value. BU coin with weight and purity backed by the Royal Mint. 3rd issue in the famous 10-coin Heraldic Beasts series. Offered in a protective plastic flip. Lot of 10 comes in plastic tube. Obverse: Depicts Jody Clark's latest effigy of Her Majesty Queen Elizabeth II, framed by her name and the face value of the coin. Reverse: Represents the mighty Red Dragon of Cadwallader, the emblem of Wales, clutching a shield with four lions in its claws. The image is surrounded by the coin's weight, purity, and mintage year. The Somalian Silver Elephant was first introduced in 2004 and since that time has become quite popular among collectors. This coin celebrates the Elephant, which are the world's largest mammal and as such as no natural predators after becoming an adult. Coin Design Highlights The design of the coin changes on an annual basis, but will always feature at least one image of an elephant. 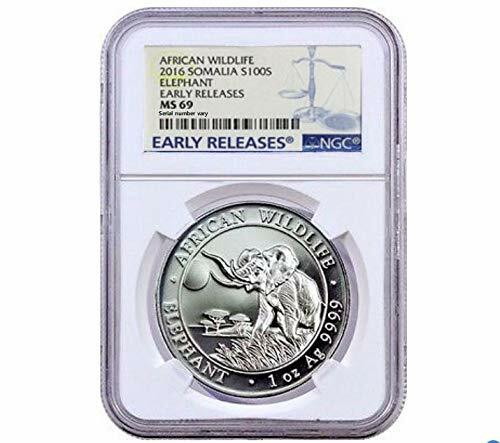 As is the case with all coins stuck for this series, the 2016 Somalian Elephant is comprised of fine silver with a purity of 99.99 percent, which is the highest possible in the industry. The coin's obverse side displays an image of the Somalian coat of arms, along with the date of the coins issue and face value, which is 100 shillings. The reverse side depicts an image of the elephant, which is Africa's biggest animal. While these coins are issued on behalf of Somalia in fact they are actually manufactured in the Bavarian Mint as opposed to within Somalian itself. The coin is available in Brilliant Uncirculated Condition, which means it will display no signs of wear. 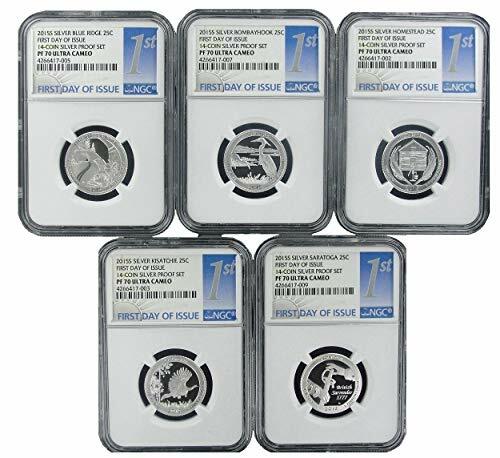 The 2015-S set includes (5) Washington quarters honoring: Homestead National Monument of America in Nebraska Kisatchie National Forest in Louisiana Blue Ridge Parkway in North Carolina Bombay Hook National Wildlife Refuge in Delaware Saratoga National Historical Park in New York All proof sets have been pre-owned and may have slight blemishes. We make sure they are close to the photos. YI SOON SHIN Sun Sin 2 Oz Silver Coin 10 Cook Islands 2017 - This magnificent 2 Oz Silver coin is the first issue in a series, dedicated to the greatest national hero of all time in Korean history - Yi Soon Shin. The coin features the Smartminting technology and comes in a themed case with a limited edition copy of the first issue of the comic book series, and a never before seen limited art print by the artist himself. Limited mintage to 500 pcs worldwide. 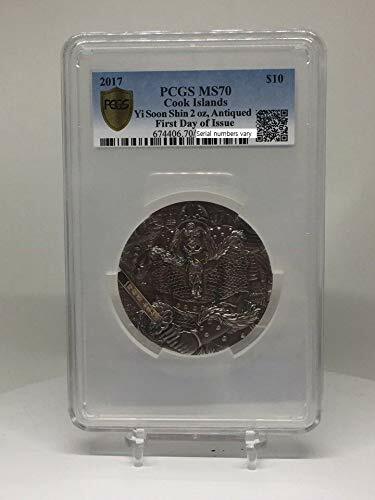 The reverse of the coin presents the wonderful and detailed image of Admiral Yi Soon Shin holding his sword in battle, over a background with other Korean warriors following him. The obverse of the coin shows the beautiful sword used by Yi Soon Shin on the left side of the coin, and on the right, the effigy of Her Majesty Queen Elizabeth II and the inscriptions: "ELIZABETH II" - the name of the Queen, "10 DOLLARS" - the face value, "COOK ISLANDS" - the issuing country and "2017" - the year of issue.